Multiple sclerosis is a debilitating disease that has long been regarded almost beyond the possibility of successful treatment. For many patients a diagnosis of MS has meant the end of a normally functioning life. Not any longer. Celeste Pepe was a vigorous 42, a busy chiropractor and naturopath, when she got an MS diagnosis. What does an expert in alternative medicine do when she gets seriously ill? Dr. Pepe realized it was time to put her deep belief in alternative medicine to the test. She resolved to find and employ effective natural ways to reverse this condition and restore her health. She did, and her multiple sclerosis is now a thing of the past. Dr. Pepe's remarkable healing odyssey took her through many disciplines, theories, and practices in the world of natural medicine, and into the depths of her own body and mind. 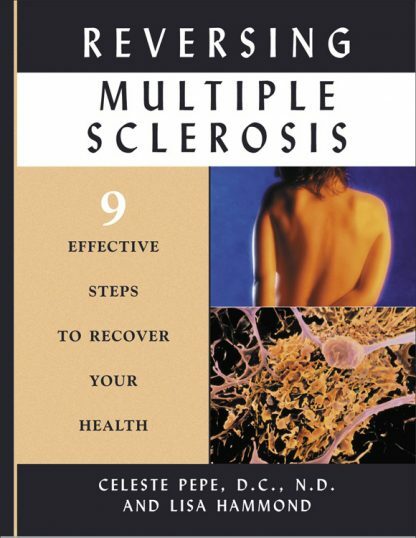 In the end, she distilled her successful treatment into a program that any MS patient can follow to restore health. She explains this with clarity, medical precision and a strong measure of encouragement. Using her own healing experience, Dr. Pepe explains the steps that can help the MS patient turn the corner on this disease: detailed nutrient testing and fortification, bee venom treatment, allergy testing and dietary changes, personally tailored nutritional plans, the use of specialized supplements, chelation therapy, regular exercise, and the replacement of mercury amalgam dental fillings. "I truly believe that if you diligently apply these healing protocols, which I have learned, you will no longer be known as an 'MS victim,'" says Dr. Pepe.